At one point in history Alex Norris' little town of Norris was a thriving gold mining town. It had a population of over 1,500 and was highly respected for the standards set by and enforced through the beliefs of Alex Norris. It was a town of wealth, of propriety, of neighborliness. Seven miles south and outside of Norris was a small cabin, surrounded by its allotted 20 acres, surrounded by mountains and a forest of evergreens. This was the Lawrence's mining claim, a small family with six children. A long day had just ended – Frederic Lawrence had just returned from his gold mines with his eldest son. Julia busied herself with a basket of mending. A warm smell produced by baking bread drifted from the kitchen proving she was still tying up her long day. All the children sat about the living room on benches or the hardwood floor finishing up their homework or playing respectively according to their ages. There was Vern, the eldest. He was seventeen and had graduated from the small Norris school three years ago. He was glad to be done with that dreaded part of his life – he and school never did get along well. He already worked as much as he could with his father, helping in the mines and trapping. He loved every opportunity he had to be with his father. Julia had moved from a place where school was more of a priority than the small town of Norris thought practical. And, so she would make Vern study a little every night, even if it were only reading from the Bible and writing a small essay – which he was doing at the moment. Julia Lawrence would always hush Ann, of course, but not before Lucy's cheeks were heated. Ann had just had her fourteenth birthday. She loved to talk. Right now she studied only because she had to. There were always so many tales of her day that she knew everyone must know. Some of her stories happened with friends, some happened in her head. Both ways it was obvious that Ann was full of imaginative life, giving all an introduction to excitement. It would take her longer than the rest to finish her school, it seemed, as she always had more to say and so it was Mother's rule she remain quiet until she completed her school. Noah was the eleven-year old genius of the family and even of the Norris school. He was still studying books along with Vern and Ann at this moment, but he had finished his homework long before even Lucy had. What he studied consisted of extra research – just to ease his curiosity and make sure his teacher wasn't mistaken, as he was occasionally. Noah had to be thoughtful in the way he approached Mr Farrows' to not hurt his pride. His caution was not much needed though, as he had a very likeable character that countered his brains perfectly, and Mr Farrows' was always impressed with his work. Young Frederic (or Fred-O as he was called often, after a folk song his father would sing to the children) was just starting school. Julia had held him back a year as she felt her young adventurous boy's spirit would have been stifled in a school room. She would have liked to keep him at home one more year, but Frederic insisted his son not be held back too much as it would be hard on the young boy having to attend school with children two years younger. And so when he turned eight Fred-O found himself also coming home at night with a pile homework – a pride soon erased away with reality. School was indeed stifling for his childish spirit, but Fred-O was still thankful to his father for not having to wait an extra year. Julie was the baby of the family. Even called baby, though she was three years old. She still contained much of her baby chubbiness, and was spoiled equally by every member of the family. Julie sat at her mother's feet playing with her little blocks of wood and cloth doll. As all the children studied, read, and played father quietly sang a family favorite. The sound of his voice muted into the children's thoughts, making the atmosphere pleasant despite the tasks some were occupied with. Had a plan one day. All in God's own way. Back to loved ones to stay. What more could he say? His words would not go. Yet couldn't hide their guilt. Who lives half as good? Frederic stopped singing, and there was silence for a few moments. Ann looked up from her books and joined in the laughter that erupted in the room. “That never happened did it?” Fred-O asked. “Of course not, silly.” Lucy said, laying her novel down – she still hadn't turned a single page since opening it. Noah and Ann laughed – Ann was allowed to laugh, just not speak about things until her school was done. “Even if it were false? I've always thought you prefer what's not real to what is,” Noah jabbed at Lucy's book. “You have anything to say on this, Vern?” Frederic asked his eldest. “Whatever Lucy doesn't want,” Vern turned back to his Bible, ignoring the glare from Lucy. Several cheers sounded as books snapped shut. Even Julia set down her work and picked up the baby, snuggling her into her lap for the story. Ann looked to her mother, silently asking if she might close her books to listen. Julia nodded toward her daughter. Ann smiled, hiding her books behind her back. Frederic's stories were something that they all loved and looked forward to each night. He was an enthusiastic story teller who could bring words to life simply by opening his mouth. “Was the man not smart?” Fred-O interrupted. Fred-O acted as if he had not heard Lucy, keeping his face and question directed toward his father. “Because they were two different people?” Noah suggested. Frederic laughed, “Very true. Let's hope it stays that way.” Frederic messed Fred-O's hair into a swirl of chaos. “Grown men don't do that,” Ann said shocked. The children smiled, settling back for the story. Just as details always expanded and grew, they never knew what was true or pure imagination. But they chose to believe most to all of it. Even Vern and Lucy. “How were they built if he did not want them?” Ann and Fred-O asked. “We do not have that many saloons now.” Vern said. “But we don't really have a good church either,” Vern added, laughing. Noah smiled, a charming twist of the lips that guaranteed an immediate friendship from anyone. “Who killed Grandpa's friend?” Ann asked. “That is sad he died,” Ann said. “It is,” Frederic's tone grew serious. “Did you know him well?” Fred-O asked. “I think he must have been a great man to be good friends with Grandpa.” Fred-O said, even though he had never met his Grandpa. “Yes, I agree, Fred-O.” Frederic paused. “After Alex died Grandpa drew into himself. He tried to cleanse the town that had started out with high ideals of Alex's. He mostly succeeded. Many of the saloons were shut down. And he was better at detecting liars than Alex had been. The town was full of greedy people that liked to hurt others – and as my father drew into himself it seemed he found more strength to cultivate a difference and not mind the nasty things people said about him. “But even as the town's reputation of morale and wealth spread, so my father continued to pull away from society. For being as an involved man as he was he was terribly close to being a hermit. “Did he tell you?” Fred-O's eyes popped wide. All the children, even Vern and Lucy drew close for this part of the story. For family secrets intrigued each and everyone of them. At this Fred-O stood up and ran to a cabinet and grabbed his father's Bible. For this part of the story had been told many times and he knew just what his father needed. “How old were you when he died?” Fred-O interrupted once more. “You were twenty-three,” Julia answered, her arms tight around the baby. Frederic nodded, pleased with the answer. “Did you find the treasure?” Fred-O asked. Vern, Lucy, and even Ann and Noah laughed mockingly at Fred-O. For they all knew the answer to Fred-O's latest question. As did he. “Why would Grandpa make it so hard to understand?” Ann asked. “And why did he make a map instead of telling you where to go?” Noah added. Fred-O's and Ann's eyes showed despair at this conclusion. Non-existent treasure was not exciting. Julia rose from her rocker, a sleeping Julie in her arms, “But now it is time for bed. Thank your father for the story and tell him good night,” Julia commanded the younger children. Sighs rose around the room. Vern and Ann resumed their studies while Lucy opened her unread book once more. The rest of the children went around to say good-night, and the house became silent. All were eager for the months to slip away into spring. But had they known what lay in the close weeks ahead they would have forgotten about treasure and wished for something else entirely. 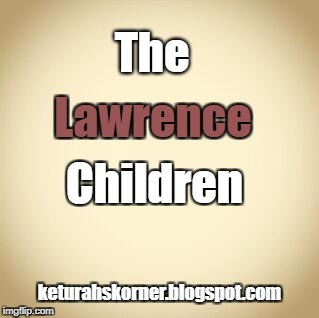 Make sure to return the second Monday of next month for the next installment of the Lawrence Children! I like it! Can't wait to read more!! Many people are obsessed with the Amish. I know at one time I was as well, and to a degree I still am. But my perception has changed with experience. It started a long time ago when my family went to an Amish-held auction (no, it's not a place where you can buy Amish children, but a place where you can buy things from the Amish). I was eleven years old and enthralled to be surrounded by so many Amish. I loved the cockscomb flowers they sold everywhere. I bought a whole box for $2 and dried them for seeds so I could plant my own. But then I experienced my first reality shock concerning the Amish. I had assumed since they lived a simpler life everything about them was completely old-fashioned and natural. Imagine my horror when I saw Amish walking around with soda cans and store-bought ice cream. "Mom," I said. "He's drinking soda!" I have a lot of time to think. Too much time. Sometimes I think about my life - why I am sitting in prison. I wonder what I could have done different - my life plays before my eyes. But even I know that no amount of good works would have stopped tyranny from finding fault with me. My stomach is empty - occasionally filled with food of no sustenance. I hide my face in my knees - as if that will somehow protect me from the horrors of this dark cold dungeon. They keep it cold to freeze me, this I know. It is a part of their game - to drive a lesson into me. As if I have a lesson to learn solely because I was convicted. 68 years for standing against injustice. How many years have I sat in here? All I know is this question, "Was I fated for this? Did God grant my birth just so I could spend life as if dead?" I cry out to God - does He hear me? After attending the writer's conference I had the opportunity to spend a week with my dad in Las Vegas (we went to federal court trials). I don't usually speak much of his work as I'm not sure all what to say about it. He keeps the public updated with what's happening in court, with all the many men locked up that he's trying to help out. I think he said there are like 19 guys right now that he is specifically trying to help release. Anyways, I was quite shocked the first day. “A bunch of guys felt that their rights as US citizens were being violated, so they decided to take back a bit of land for the “people” as a sign to the federal government to back off, and now they are all facing years to life in prison for 'terrorism' and-” My words slow down as I see the person's face slowly becomes void of emotion. Bored? Or do they not like what I'm saying…? Have I just lost a friend? What did I say???? “Oh. Yeah.. I'm not really into politics.” They say. “Oh, OK.” I say. But inside something feels wrong. Not into politics??? Hey, I hate politics. I despise them. So much stress, and fighting, and corruption. But… it's a part of life. Or is it??? EDIFY. ENCOURAGE. ENTERTAIN. Keturah Lamb is a realistic idealist learning how to both live in and embrace God's reality and believes she can rationalize emotions with philosophy and politics. She has many passions in life; humanity and humor at the top of her list. She grew up in Missouri and currently lives in Montana but travels several times a year to visit friends who live too far away. Though her first love is writing, she cleans houses as she strongly believes artists shouldn't starve. You can read more of her work at keturahskorner.blogspot.com where she posts every Wednesday.